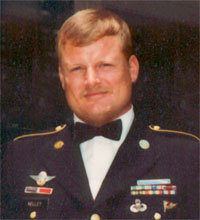 Frank KellyOlen Franklin (Frank) Kelley Jr. joined the United States Army on April 25, 1975. Frank entered the United States Army from Jackson, Mississippi and ended his tour of duty at Fort Rucker, Alabama. During his 20 years of meritorious service, Frank served with elite forces such as the 509th Parachute Infantry Regiment in Italy and the Special Forces Command at Ft. Bragg, North Carolina. Frank also served as Assistant Principle Instructor of RM1R3lN and Ranger Instructor/Lane Walker at the Mountain Ranger Camp, 2nd Ranger Company, Dahlonega Georgia. Frank retired from active duty May 31, 1995 at the rank of Master Sergeant and completed his final tour of duty in 1999. Frank was a soldier, warrior and a friend deserving of the honor to be placed on the Fallen Ranger Memorial Road.